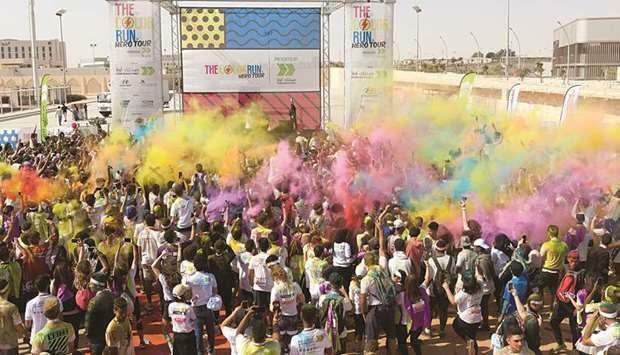 (MENAFN - Gulf Times) The Color Run presented by Sahtak Awalan: Your Health First returned to the Qatar National Convention Centre yesterday. A 'record-breaking turnout of more than 10,000 ‘Color Runners' completed the ‘Happiest 5K on the Planet' as they walked, ran, skipped, and, most importantly, laughed their way to the finish line yesterday, the organisers said in a statement. This edition of the Color Run was part of the Hero Tour, featuring an all-new Super Zone and Foam Zone as part of the 5k course. Nesreen al-Refai, chief communications officer for Weill Cornell Medicine Qatar, which runs the Your Health First campaign, said: 'The event is so much fun that it really inspires people to get active and make regular exercise part of their everyday routine, which is one of the core messages of Sahtak Awalan Your Health First.